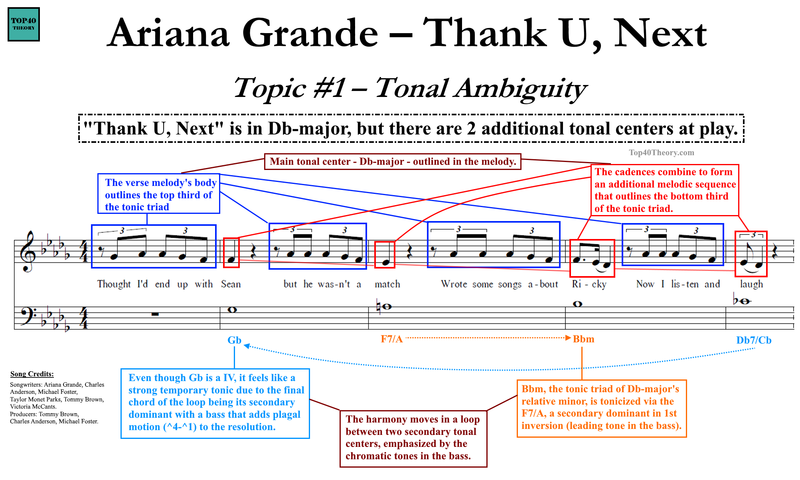 The melody in "Thank U Next" is firmly in Db-major but the harmony loops between tonicizations of IV (Gb) and vi (Bbm), creating interplay between 3 tonal gravity centers. Songwriters: Ariana Grande, Scootie, Crazy Mike, Tayla Parx, TBHits, Victoria Monét. Producers: TBHits, Scootie, Crazy Mike. In my previous post I showed how the tension in the verse lingers by ending each phrase on ^2 (D). The chorus melody does the same thing but in a different way, starting with a melodic pattern that corresponds to the harmony but breaking it in the middle in order to let the D hang. Song Credits: Songwriters: Adam Levine, Cirkut, Cardi B, Starrah, Jason Evigan, Gian Stone. Producers: Cirkut, Jason Evigan. Top40 Theory provides advanced music theory and composition knowledge, as well as consulting/coaching services, to pop songwriters and producers. You can follow Top40 Theory’s Twitter, Instagram, YouTube, and Facebook page, as well as join the mailing list via the form located in the sidebar, to receive updates about new posts and other pop music theory related musings. You can also join the growing community of highly accomplished songwriters, producers, theorists, and composers at the Top40 Theory Facebook group. 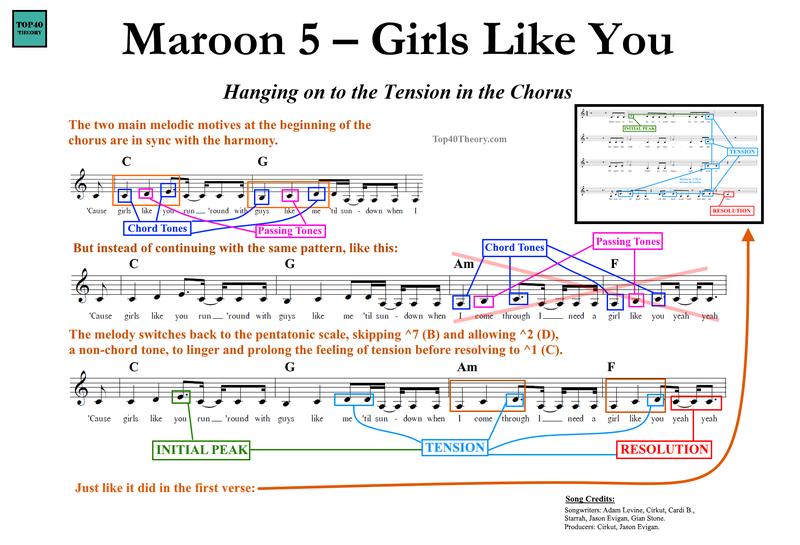 ​It's easy to overlook how notes relate to each other when they are not adjacent but it's key to good songwriting. 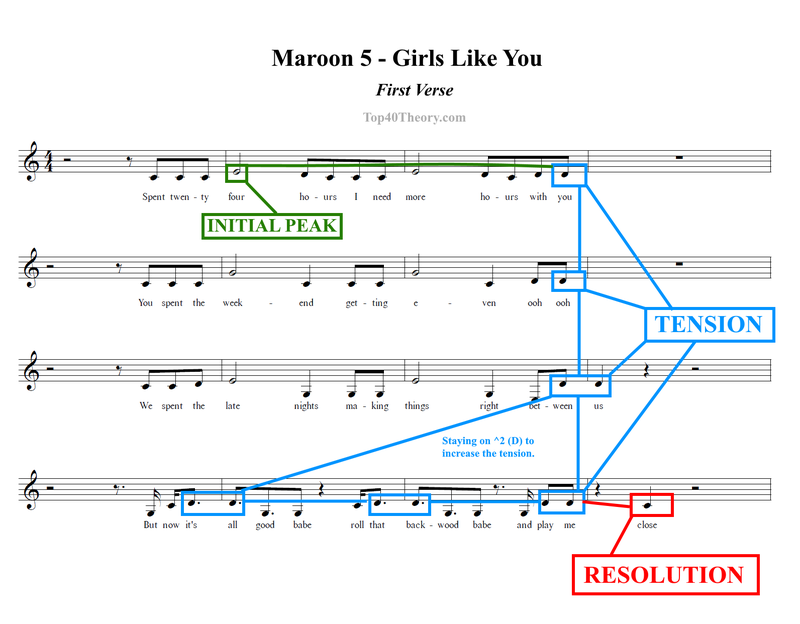 Here's how Maroon 5 maintain tension throughout the verse in "Girls Like You" by ending each phrase on ^2 and only resolving to ^1 at the end. Schenker would be proud. The Complexity of Charlie Puth's Vocal Technique & Production in "How Long"
Here's a map of (almost) all of the changes in Charlie Puth's vocal technique and vocal arrangement throughout his song, "How Long" (2017). There were even some nuances I had to leave out because there was simply no room to fit any more detail in this graph. Top40 Theory provides advanced music theory and composition knowledge, as well as consulting/coaching services, to pop songwriters and producers. You can follow Top40 Theory’s Twitter, Instagram, and Facebook page, as well as join the mailing list via the form located in the sidebar, to receive updates about new posts and other pop music theory related musings. You can also join the growing community of highly accomplished songwriters, producers, theorists, and composers at the Top40 Theory Facebook group. 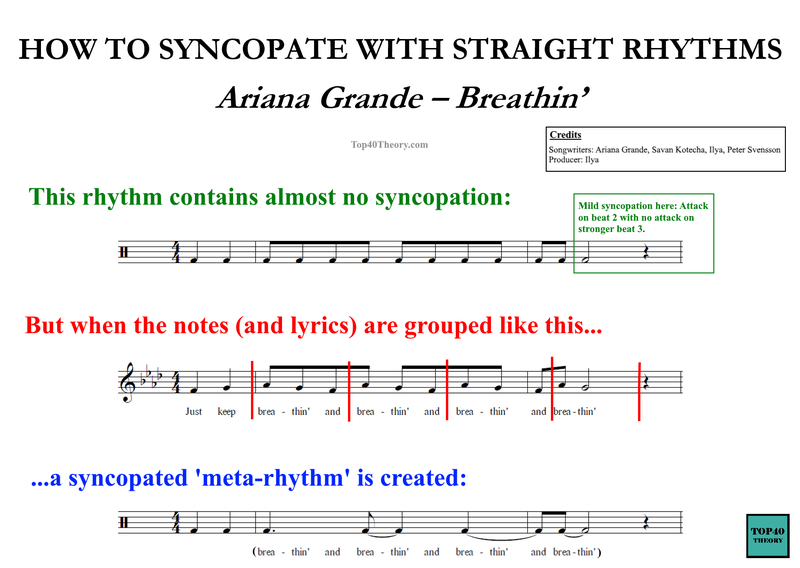 How to Syncopate with Straight Rhythms - Ariana Grande's "Breathin'"
The vocal rhythm in Ariana Grande's "Breathin'" is mostly straight eighth notes but the way they are grouped melodically and lyrically creates a syncopated 'meta- rhythm'. 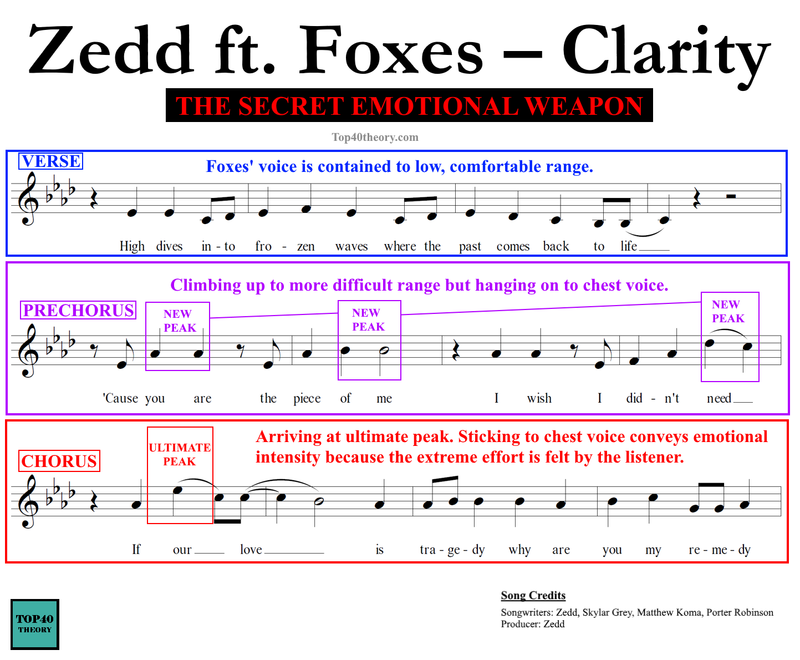 The Secret Emotional Weapon in Zedd & Foxes' "Clarity"
One of the most powerful ways to convey emotion is for the singer to venture away from their comfortable range and make the listeners FEEL the effort needed to hit those notes. Zedd's "Clarity" is a magnificent composition top to bottom, but its emotional secret weapon is arguably the way Foxes uses her voice. Despite going up to a range where it's very difficult to do, Foxes sticks to her chest voice as she climbs up to new peaks. Doing this builds up emotional intensity because it demands increasing (and audible) physical and emotional investment. And on top of that it goes hand in hand with the HUGE instrumental buildup. ​Switching to head voice, which most vocalists would naturally do at that high range, would have sabotaged the buildup and stripped away its emotional power because it would sound 'too easy' in that context. Top40 Theory provides advanced music theory and composition knowledge, as well as consulting/coaching services, to pop songwriters and producers. You can follow Top40 Theory’s Twitter,Instagram, and Facebook page, as well as join the mailing list via the form located in the sidebar, to receive updates about new posts and other pop music theory related musings. You can also join the growing community of highly accomplished songwriters, producers, theorists, and composers at the Top40 Theory Facebook group. Asaf Peres is a music theory Ph.D. who researches and writes about pop music.